Hello! 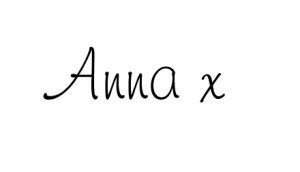 I am Anna, founder of The Pretty Wedding Shoe Company. We were excited when our daughter, Emily, announced her engagement. The wedding was going to be quite hands on as I love making things. During the planning stage Emily started to look around for some wedding shoes. She didn’t want plain, boring white ones, but rather a pair that would fit with her rustic, floral scheme and reflect her sense of fun. She found a pair online but they were out of stock everywhere! I offered to paint her a pair and being an established artist for fifteen years, my expertise and experience was put to good use. She loved them! Being quite chuffed with them myself, I popped a picture on Instagram. The response I got was amazing and The Pretty Wedding Shoe Company was born! This first pair was in fact a pair of suede shoes that she had and found comfortable, which I painted white first, before adding some flowers to them. She didn’t actually wear this original pair, because as I perfected the technique, I had started painting on satin and she wanted those instead. She actually had two pairs, heels for the day and satin flats for the evening. By the time the wedding came round, I had painted four pairs of bridesmaid shoes and little satin flats for her Flower Girls. This is them having a try on. 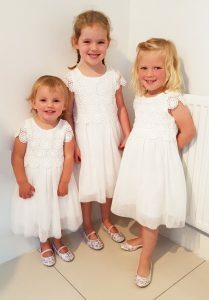 They look pretty cute, I am sure you agree! My husband and son didn’t want to miss out either and and had hand painted ties and pocket squares. Planning a wedding has really helped me understand how unique each bride and wedding is. Also it has shown me how time consuming and stressful it can be, so I use my experience to help do my bit to make buying your shoes and accessories a real pleasure, from start to finish. Where can I see your shoes? 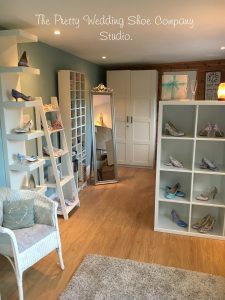 Our hand painted shoes can be seen at Wedding Fairs throughout Buckinghamshire and Oxfordshire or you can make an appointment to visit the studio. 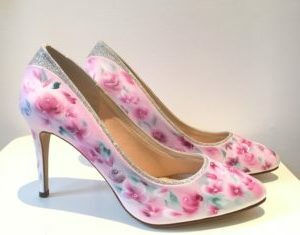 My hand painted shoes have walked down the aisle in Australia, Canada, Scotland and many destinations in the UK. I would love to be part of your wedding too! ” I just love, love, love my shoes! The colours are perfect and I can’t wait to walk down the aisle in them!” J Pottage, London. “Thank you so much for everything that arrived today! I was so excited opening it all and it was wrapped so beautifully! I will send some pictures after the wedding. Thank you again. Amazing! ” Lucy B. The Pretty Wedding Shoe Company Studio where the magic happens! Every item is hand painted by me in my lovely garden studio. I take real pride in my work and nothing leaves the studio unless I am 100 % happy. I use quality, non fade permanent colours and seal in the artwork work with a light matt spray. By painting on satin, the colours are absorbed into the material and become part of the shoe, so the art work will last for years. 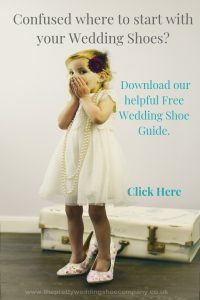 Pop on over to our shop and for more information and to order your perfect wedding shoes. Don’t worry if you have never ordered anything bespoke before – I make it as easy and fun as possible. I understand that planning a wedding can be a bit overwhelming with all the decisions you have to make. I recommend you book ahead to have your shoes painted and you can do this by paying a small deposit to reserve a slot. But if you are not ready to order yet, why not add your details to the contact form and we will keep in touch. You can also ask us any questions you may have using this form. We promise not to bombarded you with loads of emails, just a select few to keep you in the loop every now and then. Or pop on over to our Facebook and Instagram to see all the latest happenings, blogs and behind the scenes. To book an appointment by email click image below. Where is The Pretty Wedding Shoe Company ? Nearest Station is Thame and Haddenham Parkway. Direct line from London, Marylebone, Oxford and Birmingham. We are on the Bucks, Oxon, Herts Borders. Don’t worry we offer the same fantastic service by email and post your shoes out to you! Read what our Brides say!